Although it is well established in the Lord's Law of Tithing that He requires only ten percent of a person's increase as a tithe rather than ten percent of total wages as commonly assumed (see my post, "Are We Paying Too Much Tithing? "), some members of the church are still left with unanswered questions. If we are to tithe on the money we have left over after our basic expenses have been met, how do we figure out which expenses are proper to exclude before we pay our tithing? How do we adequately define "necessary living expenses"? Since I wrote my piece on tithing back in December 2012, I still get inquiries from readers who tell me they wish Church leadership would provide some basic guidelines that would help them understand exactly what counts and what doesn't. As Jonathan Streeter reveals in a recent post on his blog, Thoughts On Things And Stuff, "It turns out that the Church has made an explicit, clear, comprehensive and unambiguous statement on what constitutes necessary living expenses. They just don’t want the members to read it." Brother Streeter just completed a remarkable four part series on tithing, and I asked him if I could present his final chapter here as a Guest Post. I hope you'll read all four parts in the series (they are linked in the article below); and I think once you read Part Four below, you will have all the answers you need to calculate a proper tithe to this Church. One caveat: some information presented here has been excerpted from an official Church publication, and may not be suitable for all viewers. If your testimony is anchored in the gospel of Jesus Christ as restored through the prophet Joseph Smith, you ought to get through this just fine; but if your testimony is centered on faith in the structural LDS Church and its leaders, you might find some excerpts from that publication that could challenge your testimony. Members in the latter category are encouraged to skip this article and go do something else. In prior articles discussing the issue of LDS tithing, I have covered how it is not a voluntary requirement for church members who wish to have good standing in the eternities, as well as how there is absolutely no accountability to the membership for how the tithes are spent. Additionally, I have gone back to the original revelation on tithing given to Joseph Smith in 1838 and through a careful study of the contemporary meaning and usage of the language in the revelations demonstrated that tithing was to be paid on net income, after other necessary expenses were paid. This statement begs a very important question – what is “that which we have need?” Many people might assume that net income just means the income that you receive after taxes have been withheld or taken into account, while others may consider essential household and living expenses should also be part of the net calculation. It is quite a quandary. “How do you feel when you give a recommend to a person to come into our Temples who pays no tithing, who only pays half a tithing? How will you feel after this? You will feel that you are taking a sacred responsibility in doing that which God does not approve. He has said that the man who fails to pay his tithing shall have no place among the people of God. Yet here are these Temples erected by the sacrifice of the poor, and to give recommends to parties who pay little or no tithing, how can you feel to take this responsibility? I could not. Part of a tithing is not tithing at all in the eyes of the law that the Lord has revealed” (Joseph Fielding Smith quoting Lorenzo Snow, Conference Reports, April 1940, p. 97). Clearly this is no trivial matter and getting it right can make all the difference in the eternities. Is there a clear statement by the church as to what constitutes necessary living expenses? If so, then it would greatly remove the anxiety and uncertainty that members may feel when trying to live the law of tithing as we have seen it defined at it’s modern introduction. While it is not specifically stated, the implication is that these bolded items would not qualify as necessary expenses. What one person feels is needed, another might consider a luxury. Should a person with a car payment on a spare luxury Porsche subtract that payment from tithed income the same as a family making payments on a humble used minivan which is their only vehicle? Maybe not, but medical emergencies and insurance are things that most would consider reasonable. With these vague statements and implied threats for noncompliance, what is a member to do? In the absence of a more definitive statement on what is actually a needed living expense – it is often thought safest to simply overpay. It turns out that the church has made an explicit, clear, comprehensive and unambiguous statement on what constitutes necessary living expenses. They just don’t want the members to read it. It started with a Wikileaks style disclosure where a secret handbook given only to Mission Presidents was somehow released on the net and made available on archive.org. The author at MormonDisclosures first wrote about the handbook and it’s implications for potential tax evasion in early December of 2012. While there was still some question of authenticity of the manual as an official church document, all doubt was removed a few weeks later when archive.org received a letter from the Intellectual Property Officer of the church requesting removal of the document, thereby verifying it’s authenticity. The document was promptly removed from archive.org. Like so many things on the internet, however, you cannot put toothpaste back into the tube. Most of the Mission President's Handbook involves the procedural details of managing a legion of young emissaries as they spread the Gospel of Mormonism abroad. There is, however, a very remarkable appendix at the end of the document which deals very specifically with family finance issues. It is appropriately named Appendix B – Family Finances. Excellent! we are finally getting some specifics about exactly what constitutes necessary living expenses. Before proceeding it is important to remember where the money comes from that will be “reimbursed” to the mission presidents for these necessary expenses. This should be no surprise to church members. They have long understood that tithes are directed towards the missionary efforts of the church. Now examine the above partial list of what falls into the initial category of “necessary living expenses” – no doubt you will find that many of those items concur with your own view. There is, however, the inclusion of modest gifts in this list with the examples of “Christmas, birthdays, or anniversary” gifts. There are families that have deprived themselves of even modest gifts for these occasions so that they can pay tithing to the church. They consider these tithes sacred fulfillment of their commitment to God. They might find it odd that their sacrifice has been used to provide these mission presidents with the very “necessary” modest gifts that they had to forgo in order to pay tithes. Would the family that faithfully paid tithes and yet is undergoing foreclosure of their home like to discover that the wife of a mission president received a modest necklace as an anniversary gift, paid for out of those tithing funds? Would the family that paid tithing, but had to forgo Christmas gift giving like to hear that the children of the Mission President received a bounteous Christmas morning full of modest gifts at the tithe-payers expense? Here we see some other interesting items. Medical expenses are no surprise – most people would agree that they are necessary expenses. We will see later that these are expenses that are covered in addition to medical insurance coverage. “Support for children serving full-time missions” – while this is only to be provided if requested, I find it very interesting that it is offered at all. When I was young I was taught that it was my duty to save up to pay for my own mission. Many young men would devote entire summers of work to putting money away so that they could fund their mission. In some cases, when the young man and his family fell short, members of the ward would pitch in by donating money specifically toward that young man’s mission. It was sacrifice on the part of all parties involved. Not necessarily so if you are the son of a mission president. “Elementary and secondary school expenses” are an interesting category. Tuition and books are not charged in public schools and so tuition implies that the mission president's children will be attending private schools. This may not be surprising in foreign countries, however stateside mission presidents do not appear to be restricted from this benefit. Extracurricular activities are another notable item in this list. There are families which have a difficult time including their children in public school extracurricular activities, many of which require that the family pay into. Additional voice, dance, piano, fencing, horseback riding and other types of lessons can be costly over the years. Many of these are not a common part of the academic landscape of people who struggle to pay tithing. Their struggles appear to be subsidizing a lifestyle for the children of the mission presidents that their own children are being deprived of. “Undergraduate tuition at an accredited college or university” is quite remarkable. This is the best type of scholarship that one could ask for! It is true that there are standards for what grades are maintained and tuition is only reimbursed up to the cost of and equivalent time at the church sponsored schools, but wow! There are families who spend the decades before their child is of age dutifully paying tithing while not having the money to set aside for their children’s college. This problem is compounded when you think of the number of children that Mormons are encouraged to have. It is simply an impossibility for some with large families of greater than 5 kids and normal levels of income. Sign me up! There are a few comments to be made from this selection of remarkable benefits. First, the mission home expenses are handled differently and instead of being reimbursed to the mission president, the mission office pays these expenses directly. This does not alter the fact that these are necessary expenses to the maintenance of a home. Second, it is notable that a “part-time housekeeper and cook” are in this list. I imagine that the many Mormon mothers who, after giving birth to upwards of 4-5+ children, could do with part-time help. The brutal reality is that the cost of so many children combined with the average income means that few if any of these moms will have that benefit. Yet they continue to dutifully pay tithing, believing that they are furthering the work of the Lord, when in fact it appears that they are in part subsidizing a lifestyle that they themselves have no hope of attaining. The high rates of depression among women in Utah may have many factors. I know from personal experience that the demands on a woman in maintaining a home with numerous kids on limited funds without any help can be devastating to their energy, minds and health over the long term. It is good to hear that mission president’s wives won’t risk these pitfalls. “Transportation Expenses” are no big surprise. Many mission areas are spread over a large area and the expenses are an expected and necessary part of the calling. It is notable that family can travel with the mission president and those costs will be reimbursed. If I was a mission president in Europe, Asia or any other exotic locale – you can bet that my family would come with me on any trips I took. Educational travel experience, plus totally reimbursed equals “yes please!” Sadly, many people who struggle to pay tithing have never known anything of traveling to see the world. “Cost of a babysitter” is a very reasonable thing to provide. After rigorous supervision of the part-time housekeeper and cook it really is necessary that the mission president's wife get a break from time to time to accompany her husband to activities. It would be a terrible burden for the mission president's family to provide that out of their own funds rather than the tithes that have been dutifully given for that purpose. This is, of course, sarcasm. I think that every mother who stays at home and does the primary rearing of the children should be given a break as frequently as possible and I don’t care where the funds come from. I imagine that tithing mothers who don’t get these sorts of breaks would rather that they not be the ones subsidizing them for the mission president's wives, but I may be doing them an injustice by saying so. “The Cost of Personal Health and Life Insurance” - Forget Obamacare – I want LDS Tithing Care! Premium levels don’t matter – tithing will cover it. Deductibles don’t matter – remember that medical expenses not covered by insurance are reimbursed. Prescription medication fees? Who cares! The elderly member who may have stopped taking a needed medication because of the cost involved – yet is still a faithful tithe payer, is happy to make sure that the mission president gets his meds paid for (and his family's too). It is good to take a moment to think about the whole reimbursement arrangement for a moment. What does it practically mean? The mission president is responsible to paying for the good or service. The Church reimburses the mission president the cost of the good or service. The mission president now has his original money back, PLUS the benefit of the good or service. This should really not be surprising. Remember that tithing is paid on net income, which is income after all necessary expenses are paid. All the the reimbursed monies that the mission presidents receive fall under the heading of “necessary living expenses” and so, as I previously described, it is completely appropriate that no tithing be paid on these reimbursed funds. Certainly, as the above guideline indicates, if the mission president has passive income from other investments, then those incomes are subject to tithing and should be paid as described. Seriously. If you have money in your account that you are figuring out tithing for and you have not saved or put money into every single one of the above items (and any more that you can infer from the Mission President's Handbook), then you should put as much money into those things FIRST and then pay tithing on what is left over (if there is anything left over). Keep in mind that most of these things are things the church has advocated that people be doing anyway. Saving for education, preparing for unexpected medical expenses, providing for the security of unforeseen events are all aspects of family management that the Church has advocated in the past. Housekeeper, cook, and babysitting may all fall under the heading of supporting and nurturing your wife and providing for her physical and mental well-being. Toss in the fact that you are providing employment for another party and it is a win-win-win. These are responsible, reasonable things that should be a part of every household that can accommodate it and would benefit from it. The Church has taught you the importance of these things – they just didn’t bother to mention that you shouldn’t take tithes out of the funds used to do them. You’ve been doing that voluntarily the whole time out of ignorance which was intentionally inflicted upon you. After seeing the last article and this one you are completely justified by revelation, scripture and church policy in doing so. If your spouse or bishop raises any objection – please direct them to this article so that they can start modifying their own tithing calculations. Go and spread the Good News! And don’t forget – the next time you shake a mission president’s hand, ask him how his family likes the gifts that you have funded and how his kids are doing with the college courses that you have subsidized. Maybe check to make sure that he is happy with the life insurance policy that you are funding and ask if his housekeeper/cook is working out. One thing that is remarkable about this handbook is that it is kept completely secret from the membership at large. I think that after the above analysis it is clear why. Many people looking at the example set by the necessary living expenses of the mission president will re-examine their own expenses in a new light and it will have significant impact on the amount of money left over to be subject to tithes. But just how secret is the manual and this arrangement of reimbursed benefits? It is noted that while the church assures the mission presidents that all applicable tax laws allow this income to not be reported for tax purposes, not all countries have the same tax laws. If the fiduciary arrangement between the Church and the mission president is never revealed, as it apparently was not supposed to be, then no oversight and confirmation of it’s legality can be made. There is rumor that this may become part of the recently announced case of fraud against the church put forth in the UK. Get the popcorn ready. If you compare what is provided to mission presidents with what a majority of church members have to live with throughout the world, “minimal” is probably not the adjective that you would choose to employ. Perhaps it is considered only minimal compared to the affluence that mission presidents generally seem to come from. (Have you ever met a blue collar mission president?) The ability to accumulate and manage wealth may be a sign of a good administrator, which is part of the selection processes for Mission Presidents, I will concede. It is interesting to note that four of the current twelve Apostles were mission presidents prior to becoming general authorities (Anderson, Ballard, Scott and Hales). The percentage of the Quorum of the Seventy who are mission presidents is not immediately known to me, but could be the subject of some investigation. It is not unreasonable to consider that since these mission presidents work under the supervision of area general authorities, their performance as mission presidents may have some bearing on whether they are recognized and promoted to General Authority status. If they perform poorly it could only hurt and if they perform superbly it would certainly help. Most people might say that mission presidents are typically older, seasoned managers with deep scriptural knowledge and in the later years of their life so that they can focus on the work. At least one recent example of a 35 year old man would seem to buck that trend. Ignore the similarity between the last name of that individual and other past church authorities. They are unrelated. Okay, they might be related -but it doesn’t mean anything. Right? A church itself does not create anything of marketable value. Any money it receives, it does so predominantly as tithes. If those tithes are invested in the corporate holding of the church and the proceeds are used to pay the general authorities then saying that tithes aren’t used to pay the general authorities is just a matter of semantics. A distortion meant to deflect suspicion. What would be wrong with paying a modest stipend to the general authorities from tithing? That is what most members assume it goes for anyway. Perhaps if the allowance is somewhat more than modest, it would soften the blow to have it come from a corporate ancillary if the numbers ever leaked out. This is speculation, of course. 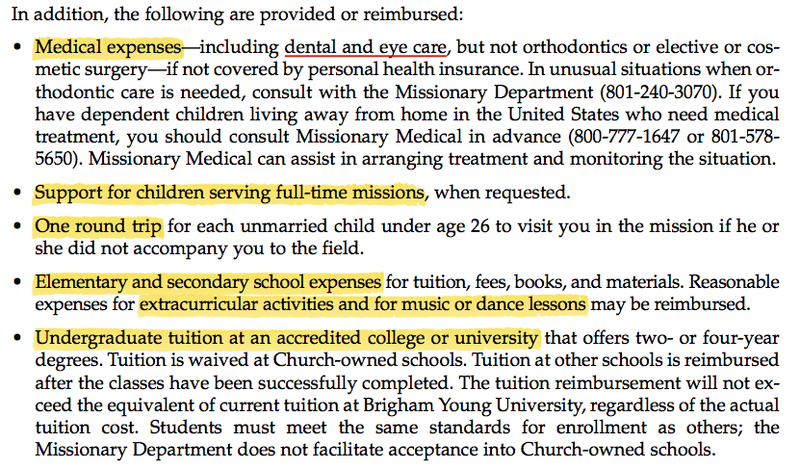 If a lowly mission president's “minimal” living allowance includes all the various benefits listed in the Mission President's Handbook as above – I wonder what level of “modest” accommodation full general authorities receive. Could it be that “modest” has a different meaning to those in the Church hierarchy? That may have implications for the hemlines and necklines of the dear sisters as well. If a mission president's allowance is "modest" then this makes sense as being modest. 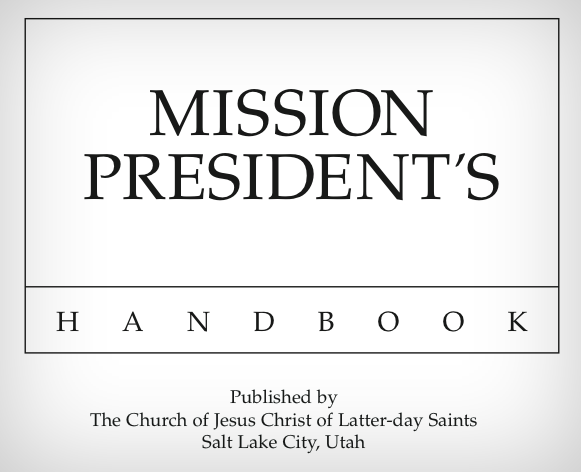 The Mission Presidents handbook is one of the first real glimpses that members may have into the lifestyles of the Lord’s Anointed. It is certainly instructive in establishing perspective when it comes to prioritizing essential living expenses as they relate to tithing. But it also demonstrates the extent to which church leaders exist off the sacrifice and tithes of the members. Over the last series of posts I have laid out how tithing is instilled into the minds and hearts of members under threat of losing one's eternal family, burning at the second coming, and is undertaken with no accountability to the membership. 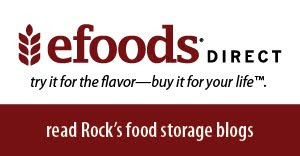 It is perpetuated with vague definitions to encourage overpayment, and the very precise information that would be needed to prioritize living expenses is specifically kept hidden from the members. If you are a faithful tithe payer, I applaud you. I have no doubt that you do so with a sincere belief in God and a firm conviction that paying money to the church is the same as paying money to God. But I ask you to remember the words of Christ in the New Testament. Did he ask people to give him and his apostles money so that they could do good with it? Or did he tell people to help others directly? Did Jesus tell his apostles to gather collections from the existing members so that they could spread the Gospel abroad? Or did he tell them to go "without purse or scrip,” trusting in the Lord to provide for their needs? As announced in my last post, henceforth all comments posting on my blog only as "Anonymous" will be deleted. I respect all reader's wishes to post anonymously, and you may continue to do so as long as at the beginning and/or end of your comment you use some type of unique identifier so that others can tell you from the hundreds of others posting as "Anonymous." With so many commenting under the name "Anonymous," the conversations have become increasingly difficult to follow. It has also become obvious that some of those posting anonymously are often among the most uncivil; rather than engage in intelligent arguments, some of these people tend to get quarrelsome. A civil argument advances the dialogue; petty and immature attacks on other's views do not. I had planned at this time to write a sort of follow-up to last month's controversial post, but yesterday I came across this announcement on Daymon Smith's website, Mormonism Uncorrelated, and felt it was worth dropping everything to bring this to the attention of as many people as possible. 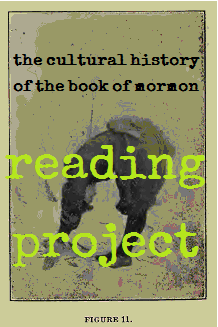 "I am starting this month The Book of Mormon Cultural History Reading Project. It will run for eight months. "For the Reading Project, I will offer for download a PDF of every book in the series, on a monthly, rotating basis. "Every Tuesday for the next eight months, I will provide, for that week, a link to download 1/4 of the entire book. That quarter of the book will be removed and the next quarter posted for the next week, until the entire book has been posted. The PDFs will be removed from my blog, so that other websites don’t mistakenly believe it is their PDF to post or to sell. "(All PDFs posted in this Reading Project remain under copyright of this author, but you are encouraged to share the PDFs with whomever you like. I just don’t want some robot selling complete copies of the series on Amazon or Scribd.)" "I will also be available to answer questions on the Facebook page for the Cultural History, as well as on the comments section of the post for that week. Not every day, but a few times a week I’ll check in to see if questions want answering. "In addition, the list price of the book for that month, and for the following month, will be reduced to $17.50. Thus, for February, Volume One and Volume Two A will be reduced in price; for March, it’ll be Two A and Two B. And so on. "In March I will also be releasing a “unified” Volume Two (with A and B), for sale at the list price of $27.50. It’ll be a big book. Volumes Three and Four will follow, as I finish the reformatting. "Finally, The Book of Mammon and The Abridging Works will be reduced to $17.50 for the entire run of the Reading Project. The Abridging Works, in particular, I believe is an excellent way to begin re-reading the Book of Mormon from a different perspective. It’s where I started, anyway." President Benson reminded us at that time that the Lord's condemnation had never been lifted. It was still in effect. To me, that was an astonishing revelation. President Benson was telling us in no uncertain terms that this church was in deep, deep trouble. Yet how many of our fellow Saints today go merrily about declaring all is well in Zion? How many blindly assume that this Church continues to be directed from on high by a satisfied deity who happily approves of every word and action of those holding high office within it? When a house is condemned, that usually means it is not fit for the owner to live in. What then does it mean when the Lord tells us his own house has been condemned, and has been almost from the beginning? Is He really still directing the organization that bears His name? I say the answer to that can be found by simply looking around. Where are the gifts of the spirit once found in abundance among the latter-day Saints? Where is the evidence of God's hand in this institution? In short, where are the fruits that bear witness of His will being implemented? I asserted previously my belief that Daymon Smith's Cultural History of the Book of Mormon is one of the most important works of LDS scholarship in recent years. He traces the entire history of our misuse of that sacred scripture, beginning with the nascent misinterpretation of what that book meant by its use of the word restoration. Some of our earliest and most prominent converts took things in a direction entirely different from that called for in the scripture itself. And for decades after, the body of the Saints as a whole pretty much ignored that sacred book entirely. When I was younger, I set out to read through the 26 volume Journal of Discourses, and I made it most of the way through. Yet until Daymon Smith brought it up, I hadn't noticed that in pioneer Utah, the Book of Mormon was almost never preached from the pulpit, and rarely talked about or read by the Saints. 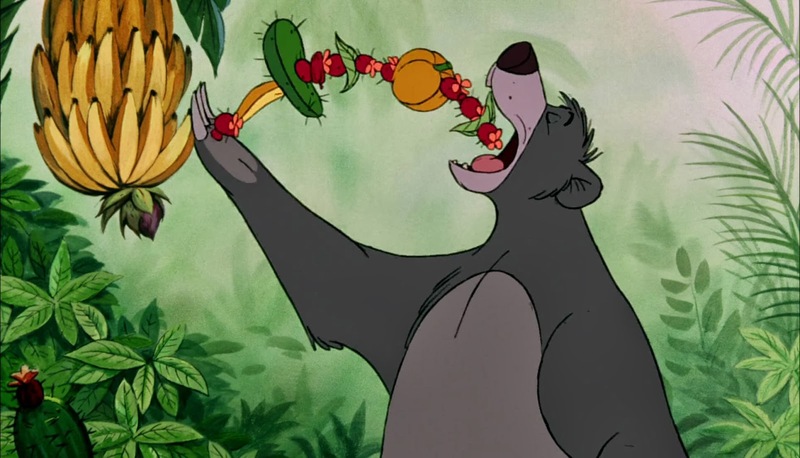 When stories from that book eventually found their way into Church publications late in the 19th century, they were geared toward children in the form of fables that predictably got a lot of things wrong. Those children's stories later formed the basis for teacher's manuals in the Church Educational System, and were eventually codified in our Sunday School lessons. Today it is entirely possible for you to discover something marvelous and revealing in the Book of Mormon while engaged in your private scripture study at home, then go to church and be taught something completely contradictory to what you just read in the scriptures themselves. The Book of Mormon is often called "the foundation of our faith" and "the cornerstone of our religion." Daymon Smith reminds us that if we are to take those slogans seriously, maybe we ought to start reading the Book of Mormon unfiltered by the dross and detritus that has built up around it by well-meaning leaders, teachers, and parents. We deserve to examine and reflect upon the teachings promulgated in the Book of Mormon in the pure form they are presented within the book itself, rather than infuse them with meanings and dogmas of our choosing. The thing that makes Daymon Smith's Cultural History of the Book of Mormon so valuable is that in these five volumes he tracks the misuse, misinterpretations, and misapplication of the Book of Mormon within the church from the very beginning, up through pioneer days, then to the present time. It is an astonishingly jaw-dropping history, and if you are not following this, you will be left behind as the most important conversation in the church today takes place around you. The first step toward getting the church of Christ back on its true mission is by learning how things got diverted in the first place. Daymon Smith's masterful history ought to be priority reading for the Remnant. The first 1/4 of Volume One is available right now for free. It will only be up for six more days, and then the next section will take its place. If you miss a section, don't worry; you can always buy the book at a reduced price during this limited time. I assume you can tell that I think the study of how and where this people got off the tracks is extremely important. It's certainly important to God, as he has told us so. I also hope that, in addition to reading these excerpts free online, you'll support Brother Smith in his work by purchasing the hard copy editions of these books, or the Nook and Kindle editions. I personally am one of those troglodytes who prefers to own and read books in book form rather than digital, and you can bet these books are given a prominent place in my library. 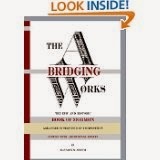 If you are not aware of The Abridging Works: The Epic And Historic Book Of Mormon Arranged In Sequence Of Composition , I'd encourage you to obtain a copy of that as well. This has become my favorite reading copy of the Book of Mormon. Like the original 1830 edition, it is laid out in narrative form, which makes it a much easier read, plus when characters are quoted, their words are in italics to distinguish from the narrative text. As the synopsis on Amazon puts it, "happily, the text has been freed from the constraints of column and verse, and oriented to the epic and historic genres more appropriate for its wingspan and tragic grandeur, for appreciating the complexity of its composition." You really haven't read the Book of Mormon until you've read it the way the Prophet Mormon would have intended it to be read. Also included is an appendix with Essays by Smith explaining the sequencing. And one more thing: since Daymon will make himself available on the Cultural History Facebook Site for questions, comments, and discussion, maybe someone will ask him to explain his eccentric choice of cover art on those books. I don't get 'em. I hope you'll join me in this amazing reading adventure. You can download the first part of volume one right now by clicking here. Since I expect the conversation about this post will take place mostly on the Cultural History Facebook page or at Mormonism Uncorrelated rather than in the comment section below, this announcement here may be premature, but please note: henceforth all commenters posting on my blog only as "Anonymous" will be deleted just as fast as I come across them. I respect all reader's wishes to post anonymously, and you may continue to do so as long as at the beginning and end of your comment you use some type of unique identifier so that others can tell you from the hundreds of others posting as "Anonymous." With so many commenting under the name "Anonymous," the conversations are becoming increasingly difficult to follow. It has also become obvious that some of those posting anonymously are often among the most uncivil; rather than engage in intelligent arguments, some of these people tend to get quarrelsome. A civil argument advances the dialogue; petty and immature attacks on other's views do not. Those with Google, Yahoo, Wordpress, and other accounts can choose to post under those accounts, which helps to lead others to your own blogs. But seriously, enough with all these people calling themselves "Anonymous." It's getting to be too much.